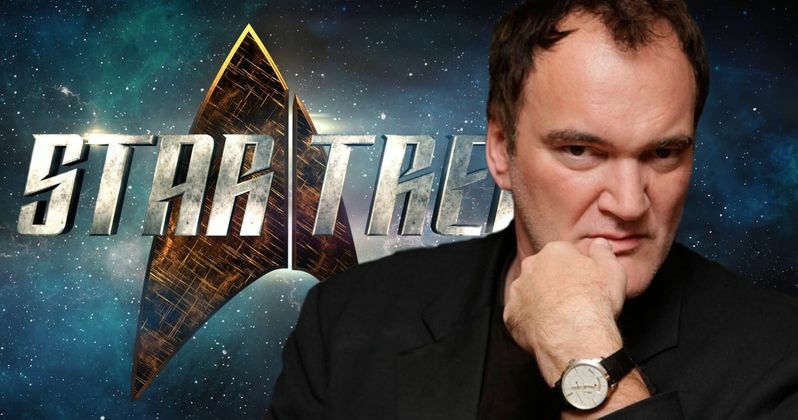 Paramount's highly-anticipated Tarantino Abrams Star Trek Movie just took another big step forward, with the studio bringing in writer Mark L. Smith (The Revenant) to write the screenplay. We first reported on this project just a few weeks ago, where it was revealed that the plan for this Tarantino Star Trek movie is to assemble a writers room to hear Quentin Tarantino's unique pitch, which won over both Paramount and producer J.J. Abrams. The writers would then craft a screenplay that Quentin Tarantino would direct from, which would make this the first time he has ever directed from a script he didn't write himself. Mark L. Smith was part of the writers room that was convened earlier this month, which also included Lindsey Beer (Godzilla vs. Kong), Drew Pearce (Mission: Impossible Rogue Nation) and Megan Amram (The Good Place). Mark L. Smith was reportedly always considered the front-runner for the gig, and his deal with Paramount closed just yesterday. The move to bring Mark L. Smith aboard is quite interesting, since the writer is best known for writing The Revenant, a movie where there are several major chunks of the movie with no dialogue at all, who is teaming with Quentin Tarantino, whose own, massive scripts are chocked full of colorful dialogue. This Tarantino Star Trek movie was first announced earlier this month, and it's already moving forward very quickly, with J.J. Abrams producing through his Bad Robot company, and Quentin Tarantino producing with an eye towards directing as well. The filmmaker is currently prepping his next movie, which is set in the year 1969 and will revolve around several different events that took place in that pivotal year, including, but not limited to, the grisly Manson Family murder of beloved actress Sharon Tate. Production will begin next spring on that movie, which Sony Pictures acquired and has set an August 9, 2019 release date for, which falls on the 50th Anniversary of the Sharon Tate murder. What's interesting about this Star Trek movie is it will boldly go where no Star Trek movie has gone before, in terms of the MPAA rating. Shortly after news of this project broke, it was confirmed that this will in fact be an R-rated movie, which Quentin Tarantino reportedly insisted on, and both Paramount and J.J. Abrams agreed to. All of Quentin Tarantino's movies had been rated R, so it's not terribly surprising that the filmmaker would make such a request, and it's also not too surprising that the studio and Bad Robot would agree, given the influx of successful R-rated movies over the past two years, including Deadpool, Logan and IT, just to name a few. Patrick Stewart also hinted last month that he would love to return as his iconic Jean-Luc Piccard character from Star Trek: The Next Generation, although there is no official indication that this project will use any characters established in previous Star Trek TV shows and movies. Mark L. Smith will get to work on the script while Tarantino works on his 1969 movie, although there is no production schedule or release date in place for this Star Trek movie quite yet. Deadline broke the news of Mark L. Smith coming aboard earlier today. The writer's other credits include Seance, Vacancy, The Hole, Martyrs, and the upcoming Overlord for Paramount and J.J. Abrams' Bad Robot, which hits theaters October 26, 2018. Star Trek 4 Canceled at Paramount?